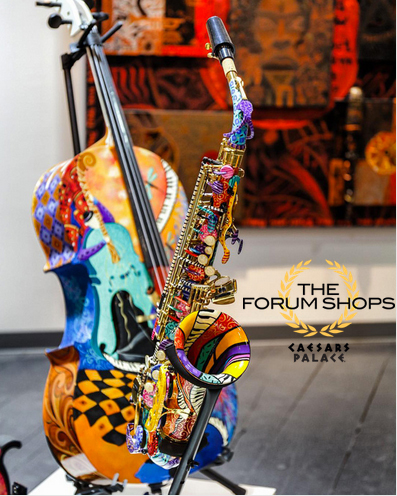 Juleez is proud to offer custom designed and hand painted saxophones by artist Julie Borden, the most recognized artist in creating hand painted musical instruments. All of Juleez custom musical instruments may also be ordered with your choice of designs, colors and themes, or shop the Sax Collection for some of my favorite designs. *Each piece is created at the time or order, unless noted it is in stock. Instruments are real musical instruments and are new. I also offer painting of your instrument, please contact me to make arrangements for shipping. Each instrument is finished with several coats of protective gloss clear coat. Juleez hand painted musical instruments are playable, but many clients choose only to display them as works of art. Each piece is unique and one of a kind. These fun and spirited musical instruments make a great statement for any collector, performance or music room. Each Saxophone features a Mendini or Lazarro Alto Sax. 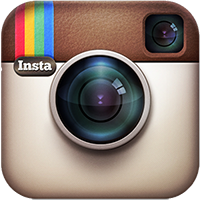 Any brand or model is available, so please inquire about brands, sizes or sending your saxophone to paint. 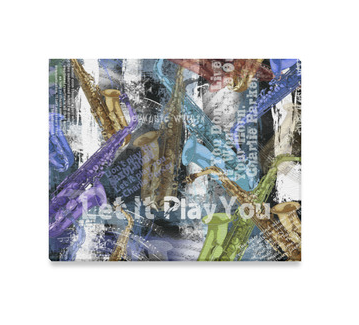 Please allow 14-21 days to receive your custom painted musical work of art, unless it is in stock. During the painting process, you will receive email updates with pictures of your instrument in process. Let the begin! Makes a perfect addition to any music art room, a special performance, or for your favorite musician. Still have questions? Would you like to supply your own instrument? Use the Express checkout below and order your custom piece today. Have questions? Give Juleez a call or email me with your questions. Thank you! "Gold Funk Fusion" Saxophone Or Choose Custom Design or ANY Design. Each instrument is finished with several coats of protective gloss Polyurethane coat. Juleez hand painted musical instruments are playable, but many clients choose only to display them as works of art. Each piece is unique and one of a kind. These fun and spirited musical instruments make a great statement for any collector, performance or music room. 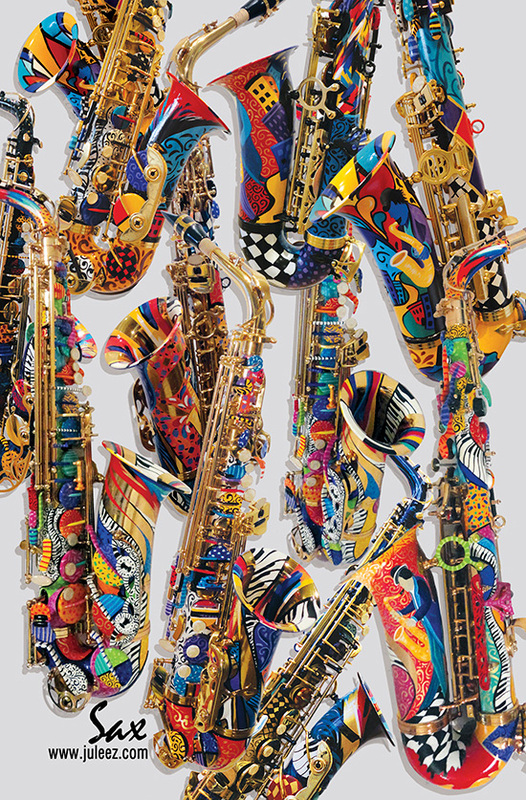 Each Saxophone features a Mendini, Lazarro or Yamaha Sax. Any brand or model is available. Please allow 14-21 days to receive your custom painted musical work of art, unless it is in stock. Still have questions? If you prefer, you can choose to send a check, or make payment arrangements. Prefer to use a credit card over the phone? Just give Juleez a call or email me with your questions. I'm looking forward to creating your one of a kind musical instrument! ​NEW! Miniature Colorful Saxophone Musical Instrument with Stand and Case. 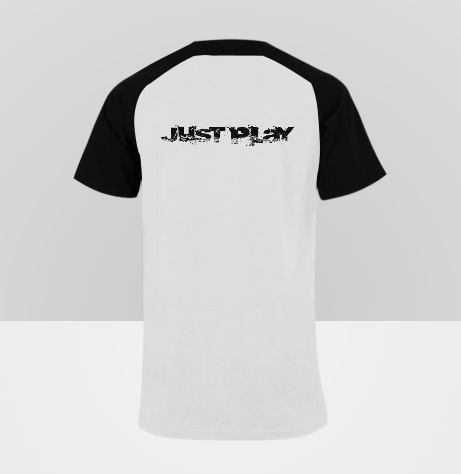 Limited Edition by Juleez with Free Shipping! Makes a great gift for any saxophone player, jazz music fan, or for your music room! Hand Painted Limited Edition Miniature Saxophone Musical Instrument with stand and case. Each of these 6.5" detailed saxophones is painted one at a time to order by artist Julie Borden of Juleez making each one a unique collector item. Fantastic gift for saxophone players, jazz music lovers, miniature collectors and music rooms! Each piece is hand signed by Juleez and each box is numbered in the edition. Features a metal display stand and unique red velvet collector box. Free shipping! Saxophone measures 6.5" Height x 2.5" Width and 1" Depth. Order yours today and be one of the first to get these amazing NEW MUSIC COLLECTIBLES! "Paint Your Saxophone" You Send Your Saxophone To Juleez to Paint. Choose Custom Design. Any Design. "Paint Your Saxophone" You Ship Your Saxophone To Juleez to Paint.